For dog owners, Halloween just wouldn’t be Halloween unless the dog got in on the fun too! Of course your dog has to get different “treats” — because candy and refined sugar are not good for dogs. But that doesn’t mean your dog can’t get their favorite doggie treats on Halloween instead. 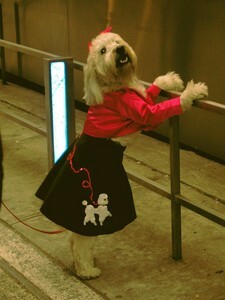 I’ve seen people dress their dogs in all kinds of costumes. Some of my favorites have been when the dog’s Halloween costume is the perfect match to a person’s costume — like a kid and his dog dressed up as Batman and Robin or you and your dog dressed up as Raggedy Ann and Andy. With Halloween right around the corner, it’s time to think about the type of Halloween costume your dog will wear this year. Well they don’t call these the coolest dog Halloween costumes for nothing. These are, without a doubt, way cool! There are far too many to mention all of the great costumes pictured here, but how about your dog dressing up as a bag of jelly beans, bubble gum, or a scuba diver? Each dog Halloween costume has simple instructions so you can create the look yourself. As themes go for a set of dog Halloween costumes, these take the cake. If you like Star wars, then you’re going to love these 3 Star Wars dog costumes that you can make: Princess Leia, an Ewok, and Darth Vader. If you’re looking for a dog costume that is unique but still simple to make, then you might want to make these dog costumes: a Frenchman, a chef, or a flower. Talk about adorable. I especially like the flower one and know just the dog that would love that costume! This list of lo is extremely creative and perfectly suited for dogs! I definitely wouldn’t have thought of many of these. See how to turn your dog into a ballerina, a college student, a rescue dog, a camel, an opossum, a doctor, or scientist. I could totally see one of the dogs I grew up with as a ballerina, she was such a little prima donna. Of course she was a poodle, so go figure! Easy is always good — especially if you’re trying to put together a quick last-minute costume for your dog. These easy Halloween dog costumes include a newborn baby, a superhero, an angel or a devil, or a bunch of grapes. None of these is too difficult to put together or make yourself. Movies are also a great place to get ideas for Halloween costumes for your dog. See how to make simple dog Halloween costumes using items from a thrift store or your own closet. Instructions are included for making a Darth Vader dog costume, an Underdog costume and a Superman dog costume. 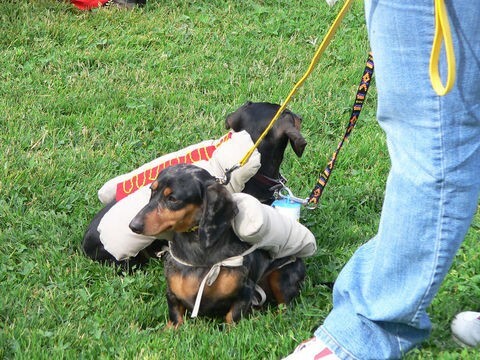 The best part: there are some really unique tips for making dog Halloween costumes, as well. If you want some hilarious dog costumes, then check out these 6 funny dog Halloween costume ideas. The best part: they all involve little or no sewing! The ideas include: a chia pet, spider dog, lego block, race horse with jockey, Smurf dog, and a dog sushi costume. How about these 19 great DIY dog Halloween costume ideas? See how to make costumes for you dog to be a football, Starbucks latte, Care Bear, chia pet, martini glass, gator bait, package carrier, lion, 3-headed beast from Harry Potter, iPhone skunk, headless horseman, zebra, chicken, and more. As you can see, there is no end to the ideas for DIY dog Halloween costumes. Of course, homemade dog Halloween costumes are not only prettier (and in most cases they last longer), but they’re more fun too! So if the idea of dressing up your dog in his own Halloween costume and going trick-or-treating with the kids sounds like your cup of tea, then there are plenty of ideas here to get you started.